The Babylon exhibition at the British Museum is a feast. It’s one of those rare cities where the reality seems to have been in tune with the myths built up over the centuries: lost until the 1850s, the dimensions and descriptions given by (largely Greek) sources seem to have been surprisingly accurate, like the height of the walls and the size of the ziggurat. The only things missing (which, of course, became the biggest parts of the myth) are the Hanging Gardens and the Tower of Babel. In some lists of the Wonders of the Ancient World, the gardens are replaced by Walls – which were pretty impressive in themselves, so that could be the reason the Hanging Gardens are the one Wonder we don’t have modern evidence of. The exhibition’s borrowed some brick friezes from the Louvre, and they’re the best bits. 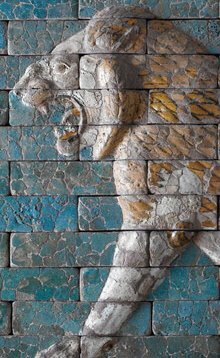 Fragments of Babylon’s walls, glazed blue bricks patterned with designs: several squares metres of things Nebuchadnezzar himself once gazed upon in quiet satisfaction, running his hand along the smooth glazes, 2,500 years ago. They’re impressive enough removed from the walls and viewed in the age of the Internet: just how incredible would they have looked to people far more attuned to the earth and seasons than ourselves, people used to subsistence farming and lives spanning a bare forty years, when they walked across the desert and saw a shimmering blue city in the distance, parts of which rose seventy metres from the desert floor? Look on my works, ye Mighty, and despair.